Bolderwood Deer Sanctuary is situated near the heart of The New Forest National Park. The Deer Sanctuary provides a convenient and fairly accessible way to get close to a variety of deer, semi-wild ponies and other wildlife. A large car park and shed-like set of toilets are all that stand out on arrival. The car park is mostly hard-packed gravel with a few loose patches, there are no marked bays but there’s plenty of space if you need extra room to get in and out of your car. The car park is free but donations are appreciated. I was pleasantly surprised to find a very spacious accessible toiled with a large, wide door that swings both ways to make entering and exiting even easier. The facilities themselves are a little drafty and pretty basic but if you’re an outdoorsy sort I’m sure you will have pee’d in worse places! Once you’ve been to the loo and got your camera ready it’s time to head into the woods. The accessible viewpoint is a very short walk from the car park but it’s steep enough to be a challenge for those who struggle with hills and manual wheelchair users. There are also a few exposed roots, branches and pebbles to contend with so watch your step. The viewpoint itself is wooden with two platforms at different heights. The top platform has step free, level access. The lower level is accessed by 3 steps in the centre of the viewpoint. Both platforms overlook a grassy patch of heathland, there are information posters telling you about the different wildlife and some simple facts about the area. If, like today, the deer are off in other areas it’s time to take an adventure. The paths are generally pretty good, again watch out for branches and exposed roots. There are some pretty steep slopes and some muddy patches too. If you’re not too confident heading off into the woods then take a look at the information from The New Forest Access for All folks. This website allows you to see detailed maps of walking routes and wheeling routes too. After a bit of a wonder we quickly came across another open patch of heath. This time there were lots of Deer! The deer are pretty used to people so I was able to not-so-subtly force my wheelchair off the beaten track and towards the fence to get better photos. Despite me wearing a bright red sleeping bag, repeatedly crashing my wheelchair and talking to mum the whole time the deer barely even looked up. The only time they did look up was when 3 semi-wild ponies came crashing through the undergrowth to investigate the brightly coloured human with wheels. The New Forest ponies are all technically owned by someone but for most of their lives they pretty much wander around doing what they like. They are obviously well used to humans and are friendly but if you do decide to say hello then do be careful. I didn’t get much of a choice since wheelchair user in mud most definitely cannot outrun a pony on a mission. I’m fairly sure I was the most fun they’d had in days and I was nuzzled and nibbled extensively. Apparently, drinks bottles, camera equipment and waterproofs are all very interesting! I took a lot of photos which I’ll be adding to flickr over the next few days. I’m currently make the most of Premier Inn’s free WiFi but it’s not great for mass uploading pics. Anyway, I hope you’ll believe me when I say the forest was stunning. 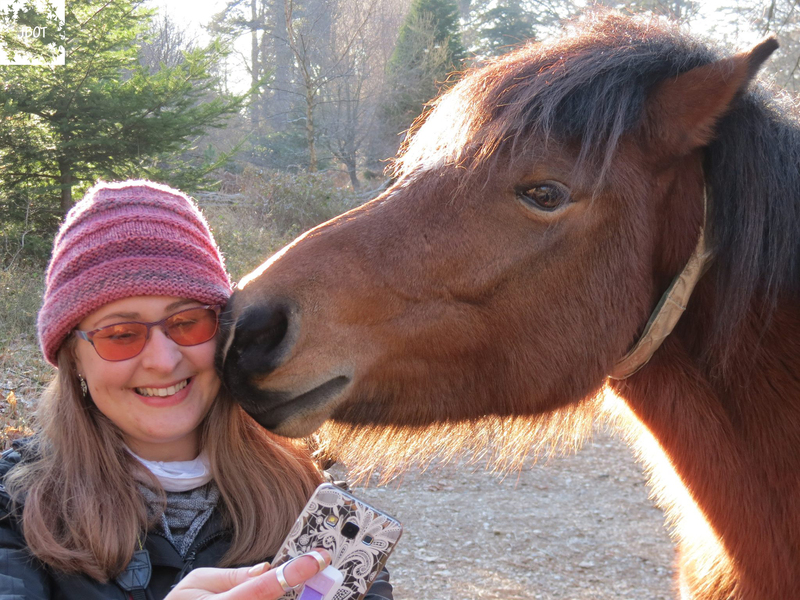 To be cuddled so much by a semi-wild horse was also incredible. I did have to make a sacrifice though. A small piece of one power assist wheel has been nibbled off. Luckily it’s something that doesn’t matter massively in the short-term. The rest of the time in the woods was lovely but I think perhaps we should have turned back sooner, mum and I were both exhausted (both from pushing me up hill) and quite cold! After a quick snack and a de-frost we left the deer park with the intention of stopping at pretty sites. Even if you don’t leave the car it’s definitely worth going for a drive. The roads through The New Forest are bordered by a mix of open heathland and old forest. I would definitely like to go back again and visit. There is so much more to explore. Hopefully this little taste of the woods will inspire you to visit too. If you’d like to see more of my photos please check out the album on flickr.